Marine Science Day: Another Successful Year! The 15th annual Marine Science Day was hosted on May 9th, 2018 at the Connecticut River Museum in Essex, New England Science and Sailing in Stonington, and our very own, Avery Point campus. In a combined effort, staff from the Mystic Aquarium, Project Oceanology and Department of Marine Sciences pulled together a day of exciting marine topics. Students in grades 4 through 8 from Ethel Walker in Simsbury, Washington Middle school in Meriden and Tyrell Middle School in Wolcott were welcomed to the Avery Point Campus to learn about the diverse marine life of Long Island Sound. Educational workshops discussed topics from food chains in Long Island Sound to the unforgiving ecosystem that is the rocky intertidal zone. The activities worked to emphasize the importance of our oceans, particularly our local marine systems. Both students and teachers were engaged in the activities, asking questions and participating in events throughout the workshops. Members of the marine sciences department hosted workshops on plankton, DNA and the benthic food chain. The Mystic aquarium team dissected squid with the students, while an intertidal-zone exploration and a trip out on the R/V Envirolab was led by Project Oceanology. In the “Meet the Plankton” workshop hosted by Drs. 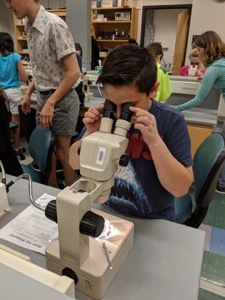 George McManus and Michael Finiguerra, the students watched phytoplankton and zooplankton scurry and bounce around under a dissecting microscope and learned about the importance of these tiny critters in marine ecosystems. 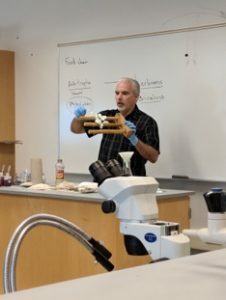 Dr. J. Evan Ward and his laboratory group hosted a workshop titled “Clams, Crabs and You” where students learned about particle selection in oysters (pictured below) and watched the food chain in action as crabs gobbled up mussels with the aid of their chelae. Dr. Senjie Lin’s laboratory group extracted DNA from strawberries, which the students converted into trendy necklaces, marching onto the next workshop in style. The variety of workshops available allowed many opportunities for the students and their teachers to be engaged in hands-on marine education. The day was a filled with adventures and will be continually hosted at Avery Point to instill curiosity for the marine environment in our local school programs. Dr. J. Evan Ward lecturing about bivalve feeding and how particles interact with the gills. A student from Tyrell Middle School observing phytoplankton with a dissecting microscope.